The excitement is in the air—tinged with a bit of apprehension, of course. It’s that wonderful first day of school. If your child is anything like mine, she wants everything to be perfect: her outfit, her hair, her backpack, and her lunch. 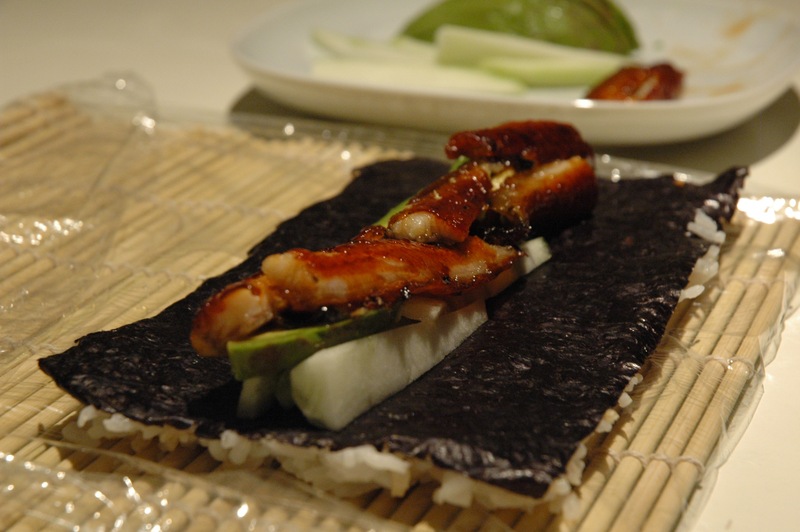 For the first day, I decide to pack one of my daughter’s all-time favorites: eel and avocado roll. If anything goes awry, at least she can find comfort in her lunch. To start, I add rice vinegar to leftover rice. I’m not using sushi rice, so it’s even more important that I don’t handle the rice too much while I’m mixing. 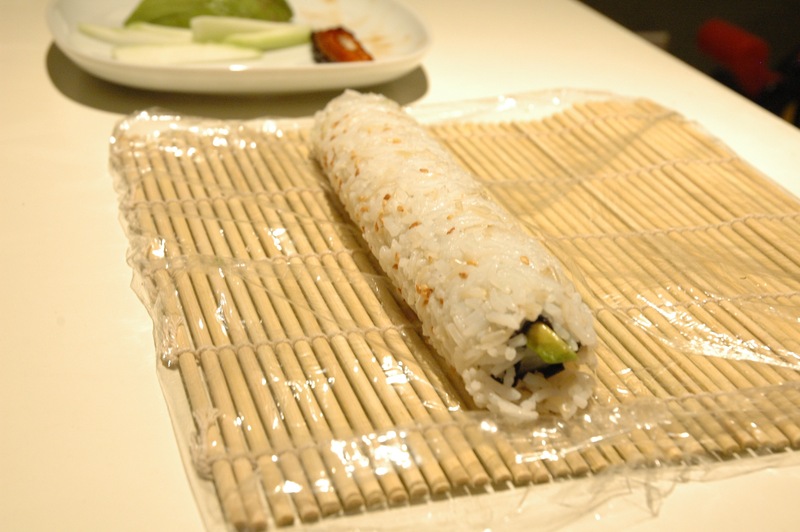 Then, I cut half a sheet of nori (seaweed) and place it on my sushi mat. Packing seaweed always reminds me of my own childhood, when my mother used to pack little strips of nori for snack time. The girls around me all had Fritos or Doritos, and they would stare at my dark crisps of saltiness with disgust. I hated the reaction the seaweed got, but I loved the way it tasted. Hopefully, S won’t have to feel similarly ostracized because of her lunch. After all, even Whole Foods and Trader Joe’s now carries little packs of seaweed. But I digress. 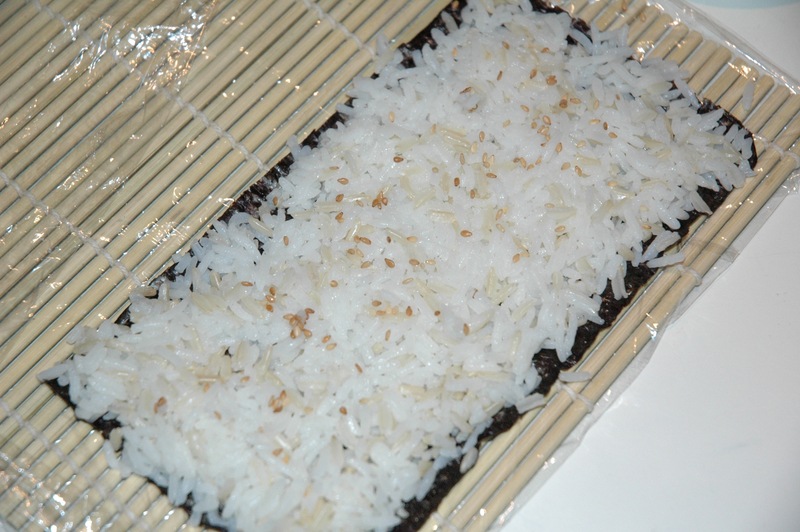 Spoon the rice over the seaweed and press it to cover the entire sheet, all the way to the corners. Over the rice, sprinkle toasted sesame seeds. Next, flip the seaweed over so the rice faces the mat, and put julienned cucumbers, sliced avocado and eel in the middle. My pre-cooked eel comes frozen from the Asian market, so I simply pop it in the oven for eight minutes and broil it for two. The result is warm, crispy yumminess. Then, I use the mat to roll the rice. This is a skill I have yet to perfect, but it’s the delicate balance of rolling just tightly enough. If it’s too tight, the filling squeezes out the sides; if it’s too loose, it won’t hold together. 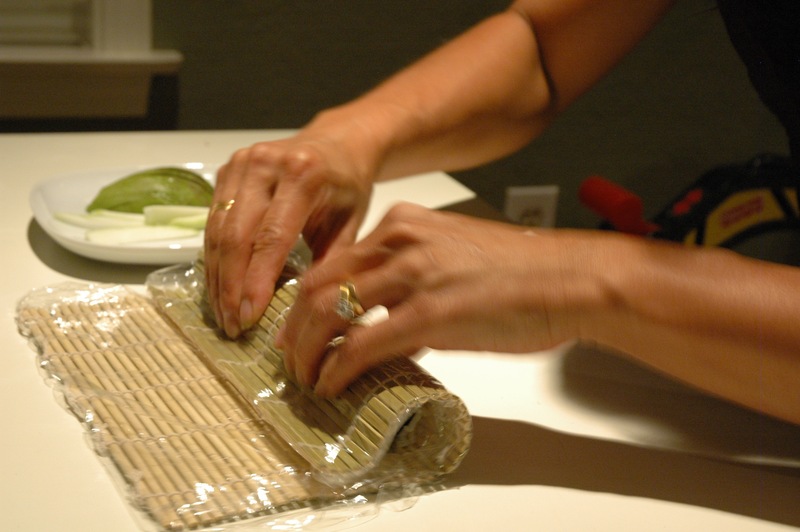 Lastly, use a very sharp knife to cut the roll. To accompany the sushi, I throw in some edamame. And to make sure she gets fruit, I add cut-up strawberries, figs from our tree in the backyard and raspberries. Voila! Lunch is made. And as a bonus, there’s enough for me to have the same!